Justice is disclosed as interdependence of deed and reckoning. The notion reveals the conformity of rights and obligations, work and remuneration, crime and punishment. Justice is deemed as a general and equal distribution of values that should ensure proper order in any society, assertion of right for each individual. As ethical notion the justice is linked primarily to the morality of social relations. It acts as with the role of certain social groups and individuals, as well as talking about their social status in the society. For the better consideration and better penetration of this concept we’d better go deep into history. From the ancient time justice existed in the culture of many nations. Its origins begin from the primigenia times. Then justice could be seen as observing existing customs and traditions. Initially this concept contained the process of nature and human relations, life in general. Later, when the class inequality appeared, social consciousness became more developed and deepened, this concept of justice determined the ratio of people’s deeds with the order established in the Universe, the customs of society, requirements of the state authorities. The ideas expressed justice of in societies of Oriental countries were rather vague and mixed. In Confucius’ ancient Chinese philosophy such view prevailed that the supremacy of grand people and law-obedience of commoners were considered as just. According to Confucius being just understood as to comply strictly with the existing norms. Mo-Ji argued that the justice brings benefits, love and mutual profit to people. Everyone had to do their own job, but work for the common welfare. 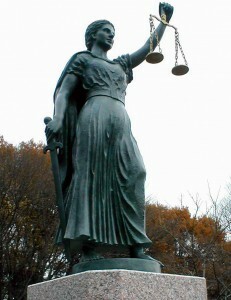 Justice became more important in the Ancient Greece. In those times the justice was not to attack any other person’s property. Mutual benefit is a justice. In the Middle Ages God was acknowledged as the only justice. Immanuel Kant in his philosophy emphasized that the justice was the measure of moral dignity, and it had to be authorities as the main priority. He insisted that it was inadmissible to do unfair things and therefore to violate our own freedom. We see that the justice has always contained an identical meaning and guaranteed benefit for the people. As for today, justice is general rule of morality of interpersonal relationships. But this is not unique. On the one side justice is understood from the point of view of mutual benefit and welfare. On the other side, justice in its original concept is understood as a blind reward to the person for the certain committed actions. And in own my opinion such statement involved a negative impact. A well-known talion principle of retaliation contains many contradictions. On the basis of the justice the person injured could “reward” to his abuser with the same. Justice, which includes equality should become the main guarantee of the state capable to set up necessary conditions to avoid conflicts required to be resolved according to the talion principle. After all, any conflict can be prevented. Then it appears another question: whether an individual should behave justly when others violate certain rules of Law? It is a personal choice and nobody can’t compel to do it but the thing is when the relevant bodies supervise the observance of justice at the highest level (property, for example), so in what way justice is monitored within interpersonal relationships? As, after all, it is mandatory that the citizens of the democratic states in their judgments, actions and statements also comply with fair treatment. Because through self-control, observing ourselves in different situations, trying to be fair we, in my opinion, grow spiritually, bypassing path of conflict and abuse. And, unfortunately, it is quite impossible to build a just society, because each of us is trained by our own mistakes which are inevitable. And often these errors are revealed due to the concept of “fair-unfair”. So, justice is not only the guarantee of stability but also serves as security for growth of any society or social group. And the person is considered as fair when he adheres to legal and moral principles, keeps his promises, adheres faithfully to his obligations, does not violate the rights of others. The person is fair when he or she tries to ignore the little weaknesses of others, even when it is hard for him/her and rewards in good way for good deeds. This entry was posted in Ethical, Social and tagged Justice, moral on 01/10/2016 by Mary. share thoughts. Great site, continue the good work! It’s actually very complicated in this full of activity life to listen news on TV, so I only use the web for that reason, and get the hottest information.